We were approaching Iceberg Alley, the area of the Atlantic Ocean off northern Newfoundland where the frigid Labrador Current flows slowly south, bringing with it huge sculpted chunks of glacier ice from Greenland. Sure enough, everyone came on deck to view a giant, craggy mountain of ice, streaked with blue and about the size of a small apartment building. It was floating lazily above a calm, gray sea. These awesome floaters are common, even in summer months, along the east coast of Newfoundland and Labrador. 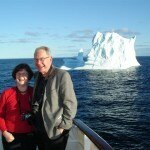 It’s one of the reasons that small-ship cruising in Atlantic Canada and Arctic waters is becoming more popular. Our expedition ship was the Hanseatic, a 180-passenger vessel designed for luxury cruising in hard-to-reach places on all seven continents. Operated by the Hamburg based Hapag-Lloyd Lines, Hanseatic normally caters exclusively to German-speaking guests but has added several bilingual (German-English) cruises each year. 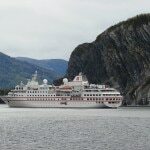 Most of the Canadians and Americans on board were veteran cruisers who wanted the opportunity to see a spectacular province in a different way. 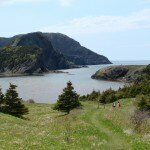 The itinerary was ideal; it started and ended in Halifax with stops in Quebec City, several large and small ports in Newfoundland and Labrador, the thousand year old Norse settlement at L’Anse aux Meadows plus a touch of France in St. Pierre et Miquelon. 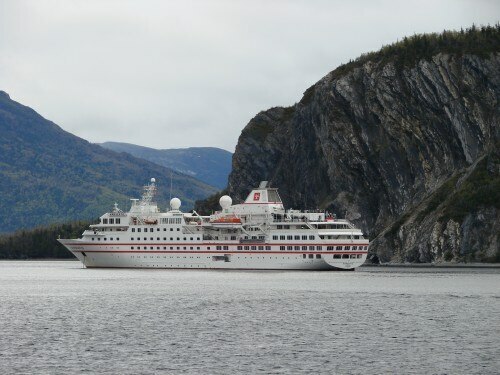 Unlike the big cruise ships, Hanseatic can let passengers see Newfoundland up close. 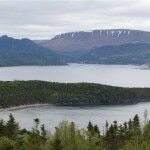 At our first Newfoundland stop near Gros Morne National Park with its ancient cliffs, lofty flat-topped mountains and deep fjords, the Hanseatic lowered its fourteen inflatable Zodiac boats and took guests along the coastline and into the small outport of Lark Harbour (it was the first-ever cruise ship visit to that community). 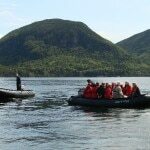 The Zodiacs then took us on a surprise expedition around a rocky bluff to an awaiting Cape Island boat. There, to everyone’s delight, the ship’s hotel manager, Doris Adler, accompanied by two local fishermen, poured flutes of iced Champagne and passed them over to the Zodiacs. A toast at sea took on a whole new meaning for us. From Zodiacs to the two formal dinners and several receptions, there were plenty of opportunities for Hanseatic guests to enjoy Champagne, as well as lobster, caviar, snow crab and the many other gourmet delicacies that define a five-star cruise ship. 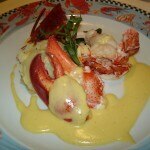 Even the buffet breakfasts and lunches included a variety of offerings as good as or better than on the large ships. Evening meals were a leisurely affair with five or six courses and constant changing of the silverware, glasses and Rosenthal china, depending on the guests’ choices. 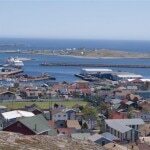 An alternative 30-seat restaurant on the top deck offered, at no extra cost, theme evenings – Newfoundland, American, French, Asian – with half a dozen small sampler dishes and a couple of larger entrees. The chef was extremely imaginative in her presentations. The level of service from the German waiters (all of whom spoke excellent English) showed evidence of impeccable training. The daily afternoon tea was also a delight with extravagant pastries and no fewer than 22 tea choices – more than Cunard offers on the Queen Mary. Germans tend to be formal and even though most evenings were billed as “casual,” the majority of male guests dressed up with shirts, ties and jackets. When there was evening entertainment (most nights a leisurely dinner and piano bar sufficed), it was a clarinet and piano duo interspersed with poetry readings.